Wieza Migel chesnut mare (Alert -Wieza Snow by Emigrant)) ? Erbach grey stallion (Alert - Eryka by Eukaliptus)) ? Emandeusz grey stallion (Alert - Emanda by Ecaho) ? ???? grey ? (Alert - El Ghazala by Ekstern)) ? Empirylla grey mare (Alert - Empiryka by Monogramm (US)) ? Loggia grey mare (Alert -Laranda by Ekstern) ? Galeona chesnut mare (Alert - Gasteria by Galba (DE)) ? Farset grey stallion (Alert - Farsala by Laheeb (IL)) ? Emossa bay mare (Da Adios (US) -Emissa by Ganges) ? Ezola grey mare (Da Adios (US) - Ezana by Eldon) ? Fuksuss light bay stallion (Da Adios (US) - Fuksja by Wojslaw) ? N......... ? mare (Eden C (US) - Norma by Gazal Al Shaqab (QA)) ? Florian grey stallion (Ekstern -Forminga by Laheeb (IL)) ? El Karo grey stallion (Eldon - Ekspulsja by Gazal Al Shaqab (QA)) ? Emirzo grey stallion (Enzo - Emira by Laheeb (IL)) ? El Media bay mare (Ganges - El Medina by Gazal Al Shaqab (QA)) ? Wildara grey mare (Ganges - Wilda by Gazal al shaqab (QA)) ? Funkier bay stallion (Ganges - Funkia by Gazal Al Shaqab (QA)) ? Eunory bay stallion (Ganges - Eunora by Gazal al shaqab (QA)) ? El Popo grey stallion (Gaspar - Elirdia by Poganin) ? Forrino grey stallion (Gaspar - Foggia by Gazal al shaqab (QA)) ? Zlota Droga grey mare (Gaspar - Zlota Orda by Pesal) ? Prosaria grey mare (Kabsztad - Prosna by Grafik) ? Espanera grey mare (Kabsztad - Espa by Kulig) ? Fellen grey stallion (Kabsztad - Fellena by Emigrant) ? Bumerang grey Gelding (Kabsztad -Brandy by Penthagonn) ? Pergos grey stallion (Kabsztad - Perga by Emigrant) ? El-Em grey stallion (Kabstzad - El Emeera by Ekstern ) ? Echira bay mare (KA Czubuthan - Echara by Wiliam ) ? Palmona grey mare (Om El Shahmaan- Palanga by Ekstern ) ? Medalion dark bay stallion (QR Marc (US) - Mata Hari by Werbum) ? Wieza Bajek bay mare (Abha Qatar (ES) - Wieza Marzen by Ekstern) ? Emandorissa grey mare (Abha Qatar (ES)- Emanda by Ecaho ) ? Eunor Dark bay stallion (Albedo -Eunora by Gazal Al Shaqab (QA)) ? Dama trefl brown mare (Albedo -Dama Kier by Gazal Al shaqab (QA)) ? Wirgilia bay mare (Albedo - Wieza Maraam by Al Maraam (IL)) ? Fidalgo brow stallion (Albedo - Formia by Gazal Al Shaqab (QA)) ? Dylan bay stallion (Albedo - Drzewica by Ganges) ? 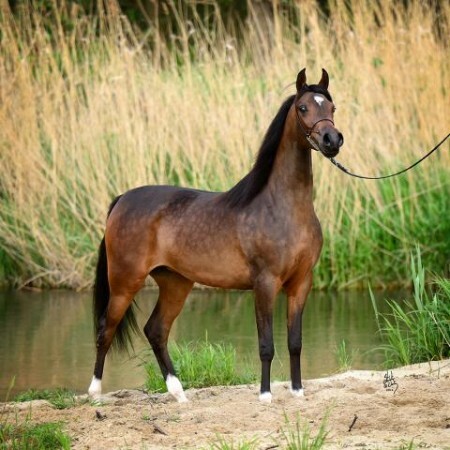 Zlota Gazela brown mare (Albedo -Zlota Gaza by Gazal al shaqab (QA) ) ? Zigareza grey mare (Albedo - Zigana by Gazal al shaqab (QA)) ? Wolej brown stallion (Albedo - Wazira by Wachlarz) ? Emilena grey mare (Alert -Emelina by Gaspar)) ? Farsalina chesnut mare (Alert - Farsala by Laheeb (IL)) ? Palangija grey mare (Alert - Palanga by Ekstern) ? Felliza grey mare (Alert - Fellena by Emigrant) ? Elnaya grey mare (Alert - Emocja by Monogramm (US)) ? Esmerida grey mare (Alert -Esmirna by Werbum) ? Ekspuls bay stallion (Alert - Ekspulsja by Gazal al Shaqab (QA)) ? Esus grey stallion (Alert - Espa by Kulig)) ? Wieza Mysli bay mare (Alert - Wieza Snow by Emigrant) ? Esperja grey mare (Alert - Estuma by galba (DE)) ? Amadea bay mare (Alert - Argolida by Grafik ) ? Ersola chesnut mare (Alert - Ernera by Monogramm (US) ? Echaruna grey mare (Da Adios (US) -Echara by Wiliam) ? Gospel grey stallion (Esparto -Giralda by Eldon) ? Zlota Pagon grey Gelding (Esparto -Zlota Nic by Emigrant) ? Chojnica grey mare (Esparto - Chojna by Galba (DE)) ? ???? grey mare (Esparto - Brandy by Penthagonn) ? Gandia grey mare (Esparto - Gazira by Eldon) ? Bebowy Pien grey stallion (Esparto -Debowa Polana by Eldon) ? E ? stallion (Esparto - Elgara by Eldon) ? Elirdiana grey mare (Esparto -Elirdia by Poganin) ? Wildana Light bay mare (Ganges - Wilda by Gazal Al Shaqab (QA)) ? El marina bay mare (Ganges - El Medina by Gazal al shaqab (QA)) ? Fukier light bay stallion (Ganges - Funkia by Gazal Al Shaqab (QA)) ? Tataria chesnut mare (Ganges - Teneryfa by Poganin ) ? Prosnega grey mare (Kabsztad - Prosna by Grafik) ? Dorsenia grey mare (Kabsztad - Dombra by Eldon) ? Perdzia grey mare (Kabsztad - Perga by Emigrant) ? Gabi grey mare (Kabsztad -Garuda by Galba (DE)) ? Picadillo grey stallion (Pegasus - Piekna Pani by Ekstern) ? Faworyta grey mare (Pegasus - Fermata by Poganin) ? Korab bay stallion (Pegasus - Karbala by Emigrant) ? Augusta grey mare (Pegasus - Adelina by Grafik) ? Elbera grey mare (QR Marc (US) - El Emeera by Ekstern) ? Emmbelarda chesnut mare (QR Marc (US) - Emmbla by Al Maraam) ? Piaconella grey mare (QR Marc (US) - Primawera po Emigrant) ? 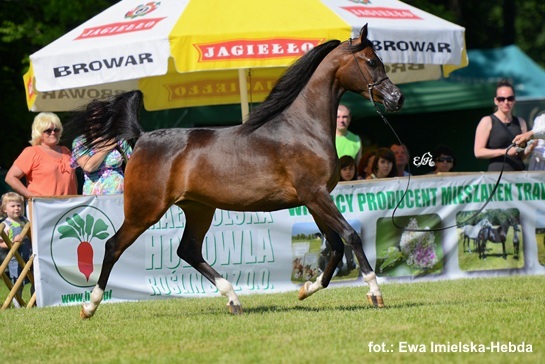 Zlota Maska dark bay mare (QR Marc (US) - Zlota Ksiega by Ganges) ? Niram baie Stallion (QR Marc (US) - Elgina by Ekstern)) ? Zlota Medal gris Mare (QR Marc (US) - Zlota Orda by Pesal) ? ?????? Bay Mare (Abha-Qatar - Wieza Marzen by Ekstern ? Ellissima Bay Mare (Albedo - Emmbla by al Maraam (IL)) ?
? grey Mare (Chimeryk -Espinilla by al Maraam (IL)) ? Willis bay-black stallion (Chimeryk -Wazira by Wachlarz) ? Zuluska Bay-brown mare (Chimeryk- Zazulka by Ekstern ? Apolonia grey mare (Ekstern - Argolida by Grafik) ? Esidon grey stallion (Ekstern - Esidona by Galda (DE)) ? Ersa grey Mare (Ekstern -Erie by al Maraam (IL)) ? ???? grey Mare (Ekstern- Estuma by Galba (DE)) ? Flamin grey Stallion (Ekstern -Flaminia by Gaspar ? Pasjenz Bay Stallion (Ekstern-Pasjenza by Enzo (US)) ? Gradus grey Stallion (Ekstern- Garuda by Galba (DE)) ? Expressja TV Bay Mare (El Omari - El Medina by Gazal Al Shaqab (QA)) ? Fello grey Stallion (El Omari - Fellena by Emigrant ) ? Liguria Chesnut Mare (El Omari - Laranda by Ekstern ) ? Winaria Light Bay Mare (El Omari - Windawa by Gazal Al Shaqab (QA)) ? Ferrmaria grey Mare (El Omari - Fermata by Poganin) ? Erneryk Bay Colt (Eryks- Ernera by Monogramm (US)) ? Eduscho grey Stallion (Esparto - Emanda by ECAHO) ? 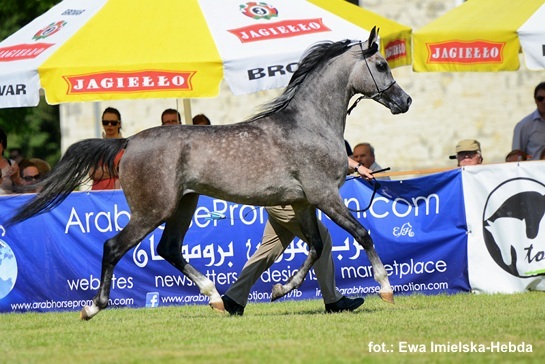 Eliksja grey Mare (Esparto - Ekspulsja by Gazal Al shaqab (QA)) ? Zakliczyn grey Stallion (Esparto - Zigana by Gazal al Shaqab (QA)) ? 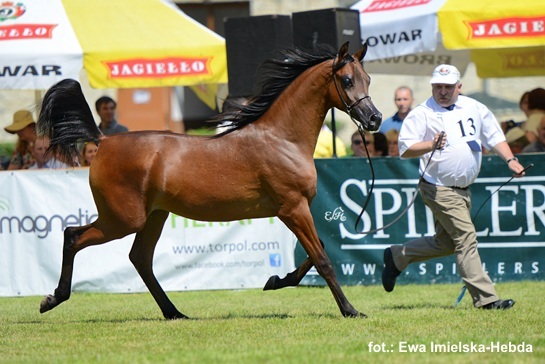 Formiss bay Mare (Esparto - Formia by Gazal Al Shaqab (QA)) ? Dysonans grey Stallion (Esparto -Dama Kier by Gazal Al shaqab (QA)) ? El Bassira grey Mare (Esparto -Emberiza by al Maraam (IL)) ?
? grey Mare (Esparto - Drzewica by Ganges) ? Embira grey Mare (Jaipur El Perseus (BR) - Embra by Monogramm (US)) ----------------------? Zwinger grey Stallion (Kahil Al Shaqab (US) -Zuzelia by Werbum) ? Elsag grey stallion (Kahil Al Shaqab (US) - El Saghira by Galba (BE) ? Zatoka Wenecka bay Mare (Kahil Al Shaqab (US) - Zatoka Perska by Wachlarz) ? Wadi Kahil light bay Stallion (Kahil Al Shaqab (US) - Wadi Halfa by Ekstern)) ? Pustynna Kahila dark bay mare (Kahil Al Shaqab (US) - Pustynna Malwa by Ekstern) ? 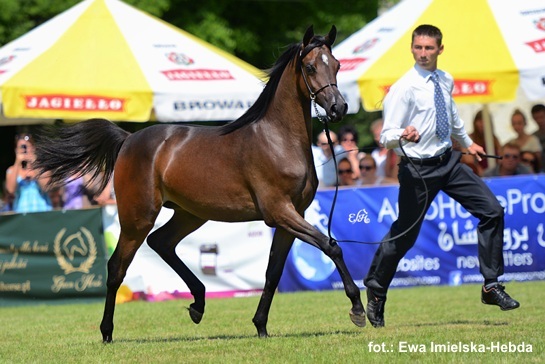 Witoria bay mare (Kahil Al Shaqab (US) - Wieza Roz by Ekstern) ? Chago bay stallion (Kahil Al Shaqab (US) - Chimera by Emigrant ? Espana grey mare (QR Marc (US) - Espadrilla by Monogramm (US)) ? Zloty Talent grey stallion (QR Marc (US)- Zlota Orda by Pesal) ? El Coronado chesnut stallion (QR Marc (US) - Ekliptyka by Ekstern) ? Gracjozo grey Stallion (Shanghai E.A (ES) - Georgia by Monogramm (US) ? Galerida grey mare (Shanghai E.A (ES) - Galilea by Laheeb (IL)) ? Karakol grey stallion (Shanghai E.A (ES) - Karbala by Emigrant) ? Burgas grey stallion (Shanghai E.A (ES) - Brandy by Penthagonn) ? Wilandra grey mare (Shanghai E.A (ES) - Wilda by Gazal al shaqab (QA)) ? Marakas light bay Stallion (Vitorio TO (US) - Mata Hari by Werbum) ? Forgissima dark bay mare (Vitorio TO (US) - Foggia by Gazal Al Shaqab (QA)) ? Pilastrino grey stallion (Vitorio TO (US) - Piekna pany by Ekstern) ?